eBrandon offers three different ways to increase the exposure of your ad for a nominal fee. 56% increase in clicks/views on the ad* when featured on the main classified page. Only 14 available per week. 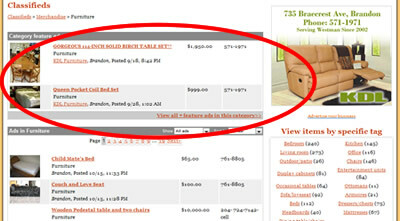 A space at the very top of the main classified page is allocated to those that have purchased main page feature ads. In total there are only 14 available spaces each week, available on a first-come, first-serve basis. Each time the main classified page loads, it arranges those 14 ads randomly and places them in an easily scrollable list that allows the user to view all featured ads. Because selection is completely random, views and prominent viewing positions are divided between all 14 featured ads. Each purchased feature ad in this space remains a feature ad for a period of seven (7) days. Should a space not be available on initial submission of your ad, you will have the option of logging in using your Ad ID or password and upgrading to this type of feature ad when one becomes available. With well in excess of 10,000 local ads at any given point in time, your average user browses the eBrandon classifieds by specific categories that are of interest to them. As a result, individual category listing pages are some of the highest-traffic pages on the site daily with many categories averaging over 1,000 daily unique visitors and over 3,000 pageviews from people that are specifically interested in browsing that category's type of ad. 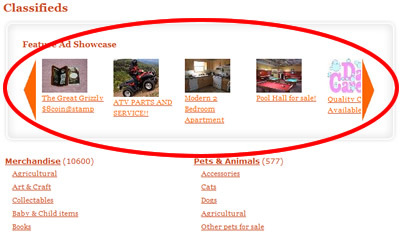 eBrandon now offers a category feature ad system that makes use of space at the top of each classified category to give you more exposure and ultimately increase your chances of selling. At the top of each category are two ad spaces delegated specifically to ads that have been purchased as category feature ads. Based on all category feature ads purchased by all eBrandon classified customers, two ads are randomly chosen each time that category loads and shown in a very prominent area above the listing of all standard ads that have been placed in the category. As well, prominent linkage is added from this top area to allow those browsing the site an easy way to view all ads that have been featured within a category in order to give you exposure even if your ad wasn't one of the two chosen ones for a particular page load. 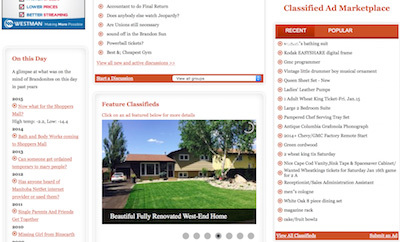 With how the system is setup, as the classifieds user narrows in on the classifieds' categorization structure it will show category feature ads that are more likely to be a match for what a person is looking for. For example if you sell Ford cars and upon initial submission of your ad you selected the tag "Ford", when the user is browsing all ads that have been tagged with Ford they will only be presented with category feature ads that have been tagged Ford as well. While standard classified ads in free categories are not intended for business, businesses have the option of purchasing category feature ads that will share this space with any standard ads that have been upgraded to category feature ads. Should you decide to not take this upgrade upon initial submission of your ad, you will have the option of logging in using your Ad ID or password and upgrading to this type of feature ad at any point in time. In the centre column of the main front page of http://www.ebrandon.ca is a section that rotates through classified ads that have purchased this upgrade. At most 12 main page feature ad upgrades are available to be purchased every week in order to maximize the value and exposure of those that have purchased the upgrade. Each time the front page of the site loads those ads are randomly sorted and rotated in the designated space on the front page, rotating through them in a slideshow format. Because your ad's picture is prominently displayed in this space, it's highly recommended to included one on your ad in order to have the best chance of standing out.